Seasonality in retail is a broad term that can mean vastly different things across a company. 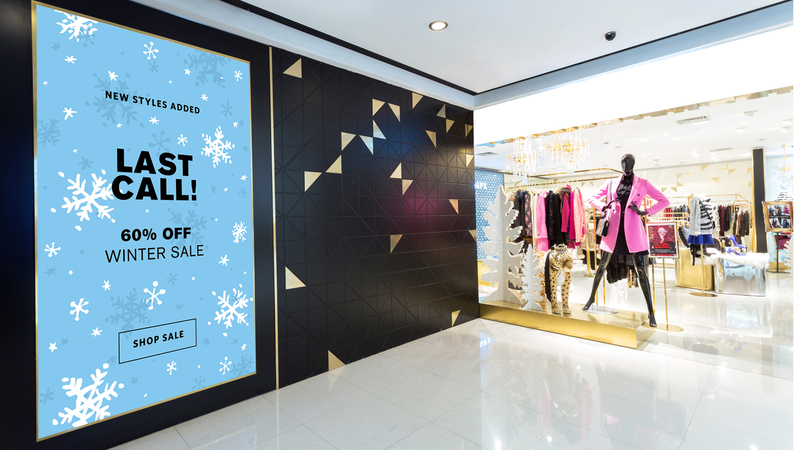 During the holiday season, digital signage is often used to promote merchandise on a carefully planned marketing schedule. Beyond this traditional application, the holidays are a time to make an impactful and lasting impression through your digital displays. Think outside of the (gift) box to create a ‘feeling’ with your brand. This is an opportunity to use digital signage to enhance that feeling, improve upon it with your digital content and to make a lasting impression on your customers; one that matters. How we choose to speak to consumers matters in the context of retail seasonality. Brand awareness has a strong relevance during the holiday season. While many shoppers may just be shopping for the best deal, that ‘winning’ feeling will eventually fade away. Take the experience a step further: imagine being bundled up with your family, standing in Rockefeller Center to watch an extraordinary projection show on the side of the Saks Building. The experience leaves a lasting impression about the brand and is associated with a memory that will last a lifetime. The holidays are a great time to use technology (Projection Mapping in the case of past Saks deployments) to evoke a feeling and create that lasting impression for your brand. That said, technology cannot do this alone, even in the most extraordinary deployments. It is only part of a varied and complex ecosystem that combines content, lighting, mixed applications and data streams, triggered media, infrastructure, merchandising and fabrication. The best holiday window displays, the ones that make an impact on the consumer, find the perfect blend of these elements. Seasonal retail installations that delight audiences and exceed expectations may require custom work to offer a truly unique digital experience. High-quality concept development can mean several hours of well spent professional consultation. This can be a significant cost when best-in-class resources are enlisted. Exceptional deployments may require reliable, commercial grade equipment that is built for a specialized purpose or usage. The results are generally best measured in ROO vs. ROI. Like voices in a choir, an extraordinary digital deployment is the result of various technologies working together in harmony. Digital deployments operate in a fragile ecosystem with many moving parts. Seamless collaboration between these technologies will often require integration, and, effective integration takes time to understand the requirements, build out a solution, and test the results. 3. Complex is not always bad. The best and most impactful digital deployments are often very complex. Operating systems, graphics cards, installation teams, fabrication, procurement, data and a host of other critical mechanisms must work together in precision to make the experience a success. No one said this would be easy, but then again, nothing worth doing ever is. If your digital installation hits a holiday homerun, congrats to your team and may the returns be many! If you have missed the opportunity this season, fear not! This is a great time to create a plan and develop budget for next year’s digital installation that will wow customers and make a lasting impression. Don’t be the brand that misses the seasonal opportunity to use digital signage in a new and exciting way because the task seems overwhelming or unaffordable. With the right planning and execution, the result are absolutely worth the effort. © 2019 RMG Networks Holding Corporation. RMG, RMG Networks are trademarks and/or service marks of RMG Networks Holding Corporation. Brought to you by RMG. With RMG® intelligent digital signage systems, businesses can craft engaging and effective digital stories their audiences want — and need to see in real time.